Welcome to the world of Duck! For too long this misunderstood species has been waterlogged in their ponds and marshes; for too long has this loyal, honourable yet touchy race been left unstudied. It may be that scientists are too afraid of raising an insult from them; it may be that this secretive race 'persuaded' the philosophers to stop their studies. Whatever the reason for the reticence, the Quester's researchers have finally put together a definitive guide - well, almost - to Duck. And have strangely disappeared. * Complete rules for playing Duckbob, the water-borne game unique to Duck! Develop the potential of Duck to the full - let Duck paddle freely in your campaigns! 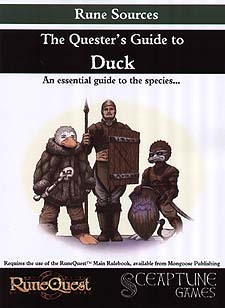 Requires the use of the RuneQuest Main Rulebook.